Adult Millipedes are dark brown to black, 5/8 to 1 1/2 inches, cylindrically shaped with multiple body segments. Each segment will have two pair of legs, except for the first three segments, which have only one pair of legs each. Millipedes are nocturnal or active at night. During the day millipedes will be found under stones, firewood, grass clippings, leaf litter or mulch and other debris that retains moisture. At night millipedes may be found crawling along the ground or up tree trunks and the sides of dwellings. 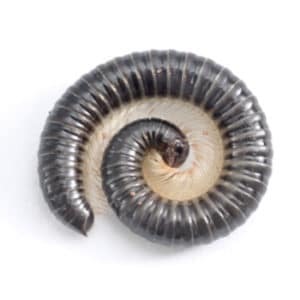 Millipedes eat decaying organic matter. They are very helpful in recycling leaf debris and providing soil enrichment. Millipedes frequently invade homes in large numbers due to standing water or drought conditions in their environment. Millipedes usually coil up tightly when disturbed and may secrete a foul-smelling fluid. The best control strategy for Millipedes is moisture reduction of the yard. Moisture reduction methods include removing debris and clutter from the yard, dethatching the lawn, keeping the grass short, bagging clippings, edging the lawn and watering the lawn or landscape early in the morning. Maintaining caulking and weather stripping in good repair will also reduce indoor populations of Millipedes.